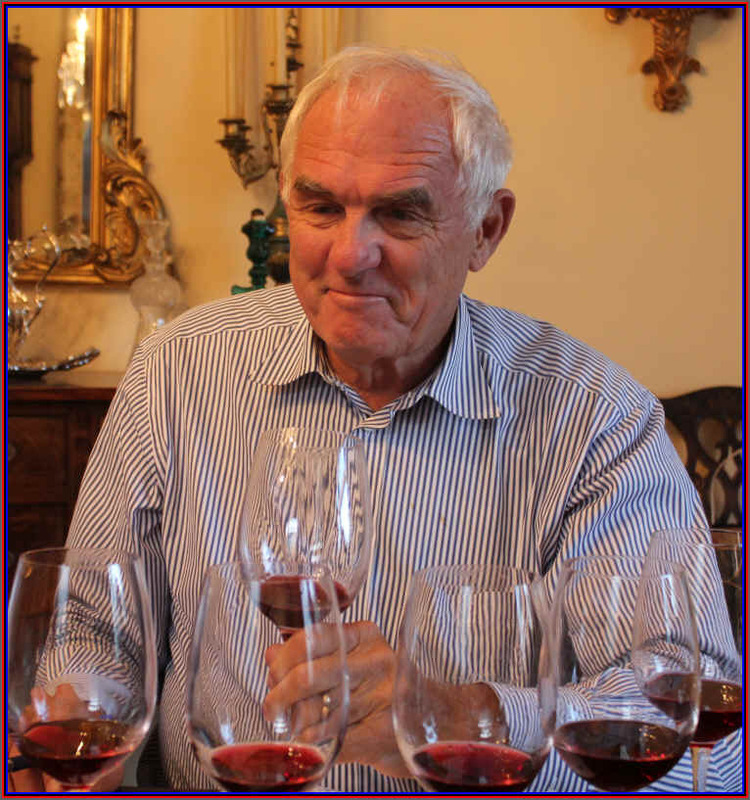 Tasting host Allan Anderson was interested in exploring Sonoma Pinot Noirs, so we put together a set of wines featuring six from the Sonoma Coast appellation and two Russian River Valley wines. 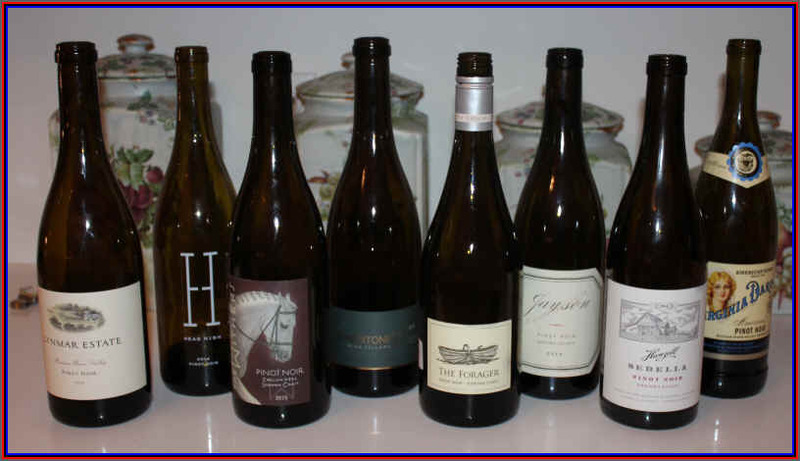 The tasting panel noted this was a difficult flight of wines as all were certainly drinkable and a few were quite attractive. The range of prices would suggest a greater disparity in quality, as the wines retail from $24 to $68. One wine, despite having a last place vote, was significantly ahead of the pack in terms of points. I was a bit more of a critic regarding these wines, as my top choice was probably the lone wine I'd purchase. Still, the set of wines was of "good" quality if not exceptional. Old-timers remember the Virginia Dare label being used by the Garrett winery ages ago. The label was launched in the 1800s and the name came from the first English baby born in a British colony...in this case, Virginia. The brand continued into the 1960s, at least. These days the label is owned by Francis Ford Coppola and they're using it for Chardonnay and Pinot Noir, a far cry from the days when the Scuppernong grape was the wine in a Virginia Dare bottle. This was clear in appearance and medium garnet in color. There was a mildly fruity fragrance with a tomato leaf tone on the nose. Dry and reasonably acidic, it's a medium-bodied red. Lightly tannic and with a hint of fruit, the flaw here is simply being shallow and/or hollow. It's in the direction of Pinot Noir, though. No stars on my 3 star scale, indicating a wine of standard quality...technically sound but not offering much character. 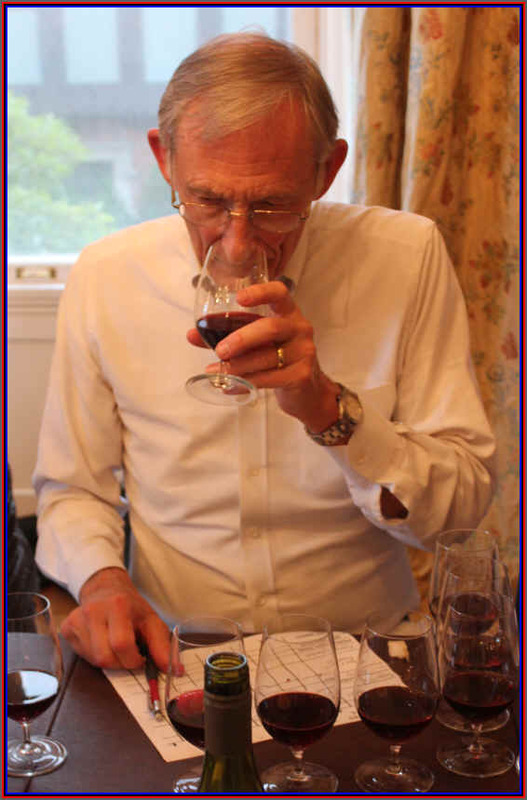 7th Place: HANZELL 2014 Sonoma Coast PINOT NOIR "Sebella"
Hanzell was a famous producer of Chardonnay and Pinot Noir back in the late 1950s and early 1960s. 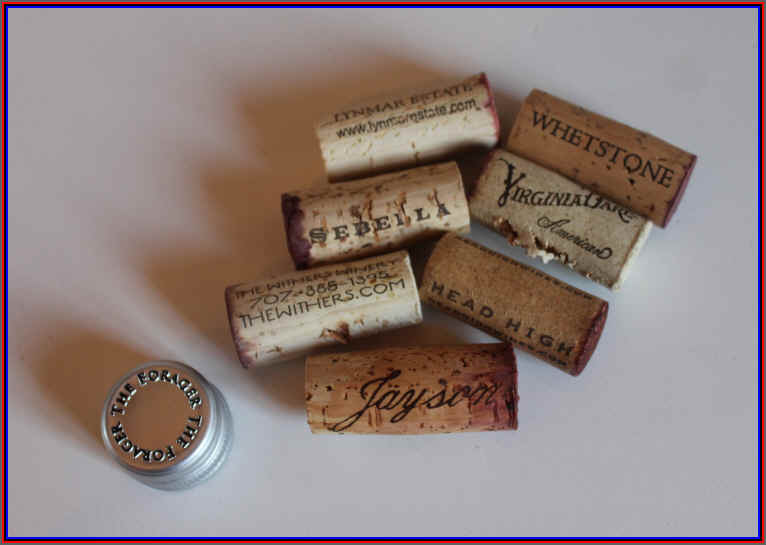 Their claim to fame was earned for their being the first to employ French oak cooperage in making their wines. Over the years the price of their wines has escalated as they cash in on their fame and prestige. We've tasted some wines over the past few vintages and have not been impressed, so we thought we should include this "second label" in this tasting to see how they stack up. This wine is medium-light garnet in color and it's clear in appearance. There's a light cherry fruit on the nose, but after a sniff of the rest of the wines, this seemed less impressive. Dry and mildly acidic, the wine is medium-bodied. On the palate, this shows mild tannins with very faint fruit to go with it. Finally it seems to be more about structure than it is about Pinot Noir fruit. It's a rather standard quality wine with an undeserved premium price-tag in my view. No stars. This is a second label from the Pahlmeyer winery and it's often better than most first label wines. I found it to be quite good, but clearly the group did not agree. I found a wine of medium garnet color with a nicely aromatic fragrance of red fruits...berries...cherries...the wood is well-integrated, so it's not very prominent unlike previous vintages. It's dry and mildly acidic, with medium body. I liked the intensity of the fruit and felt it balanced the touch of tannin here. Red fruit down the middle made for a nice wine. One star+. A couple of earlier vintages had been remarkably good and our first tastes of the 2015 left us nonplussed. 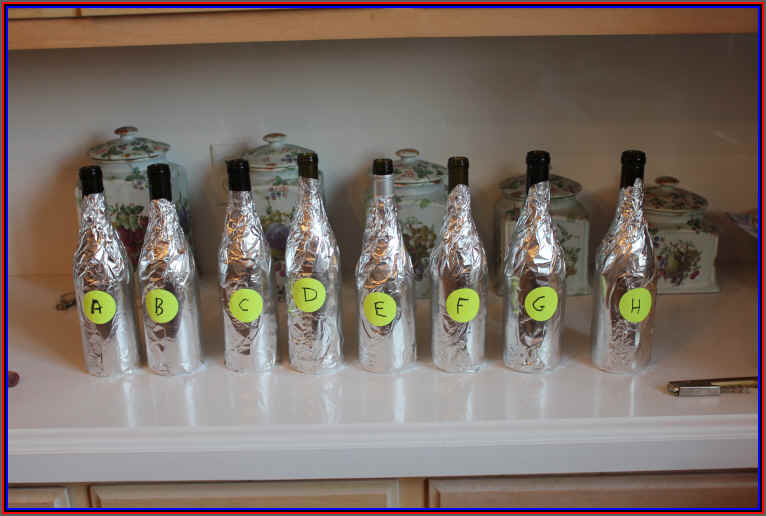 We thought it a good idea to include it in this line-up and see if the wine shows well against the competition. Unfortunately our first impressions were confirmed. The wine is clear in appearance and light garnet in color. There's a very faint red fruit aroma, but it's not distinctively Pinot Noir. Dryish on the palate and with reasonable acidity, it's medium-m in body. 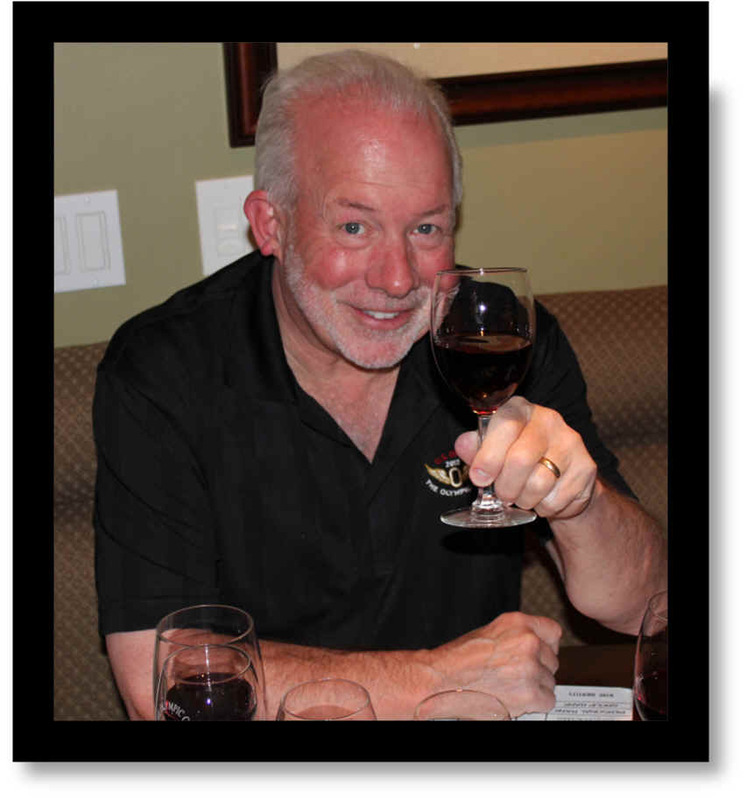 It simply lacks varietal character and is just a standard quality red table wine. Perhaps it's worthy of a half-star rating, but that's not awarded with much enthusiasm. 4th Place: WHETSTONE 2015 Sonoma Coast PINOT NOIR "Jon Boat"
Medium garnet in color and with a clear appearance, there's pleasant red Pinot Noir cherry-fruit here on the nose. Dry and mildly acidic, it's medium+ bodied. Nicely varietal on the palate, it shows good red fruit and is easily identifiable as Pinot Noir. 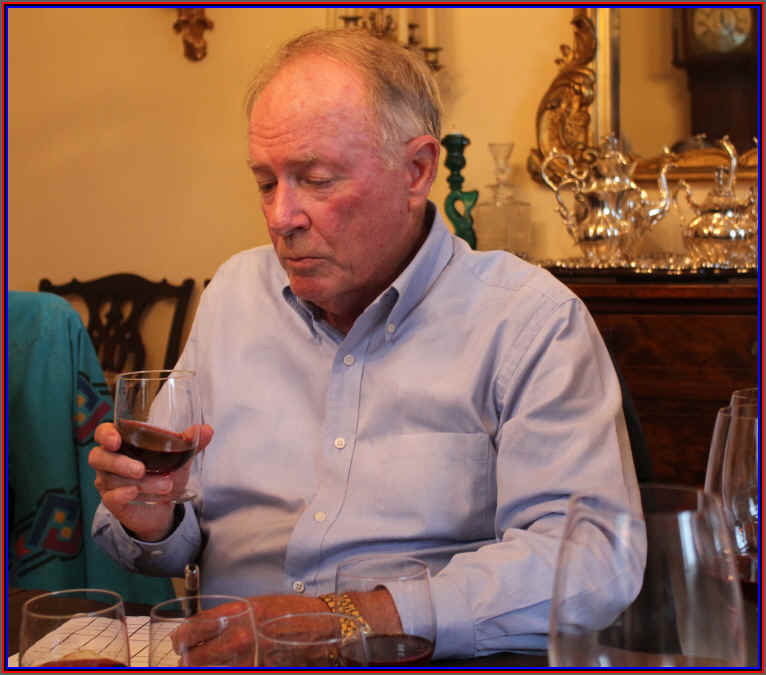 The wine is rather supple on the palate, so it's probably best consumed in its youth. One star+. 3rd Place: THE WITHERS 2015 Sonoma Coast PINOT NOIR "English Hill"
Clear in appearance and with medium+ garnet color, this was my top wine of the tasting. The nose was the most distinctive for me and it seemed to have more complexity to its fragrance than any of the other wines. I found notes of sweet cherries and Asian spices here. 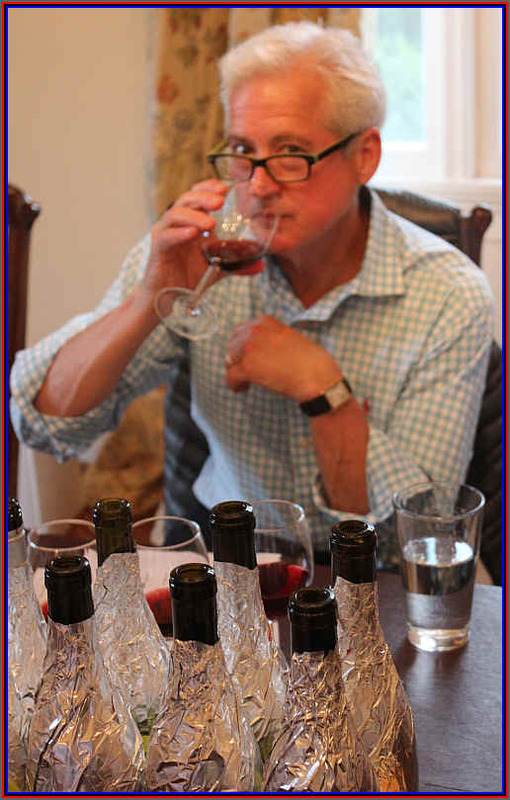 Very focused on the fruit, not oak. The wine is dry and moderately acidic, with medium body. The flavors are intriguing and complex, with notes of red cherry fruit, an ample level of sweet oak and a touch of orange peel and spice. It's not really classically Burgundian Pinot, but I found it quite charming and appealing. A sales rep mentioned this new brand was selling well and it's relatively reasonably-priced, so we took a flyer and included it in the tasting. It's clear and medium garnet colored, with some typically floral fragrances and nice red fruit aromas. I also detected a mildly herbal tone on the nose. It's dry and is on the softer side of the spectrum...medium- in body. I found the flavors to be reminiscent of Luden's Cherry Cough-drops and its candied character made this less attractive to me. The wine was generally well-liked by the tasters, though. I gave it a one-half star rating. Clear in appearance and garnet in color, I didn't find the aromas to be hugely expressive or intense. They are correct, though, showing some red fruit and cherry notes. The wine is dry and mildly acidic with medium body. There is an element of charm here, though. Good Pinot fruit on the palate and it's fairly smooth. You can drink this now and it ought to hold nicely for a couple of years. 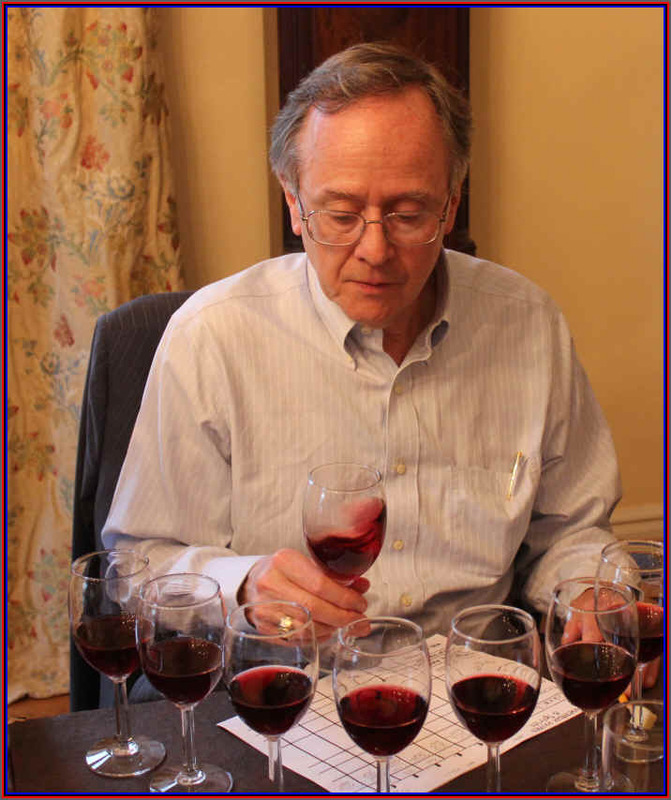 Our long-time tasting pal Pat Donahue passed away a week prior to this month's tasting. Pat had been battling a rather debilitating disease. 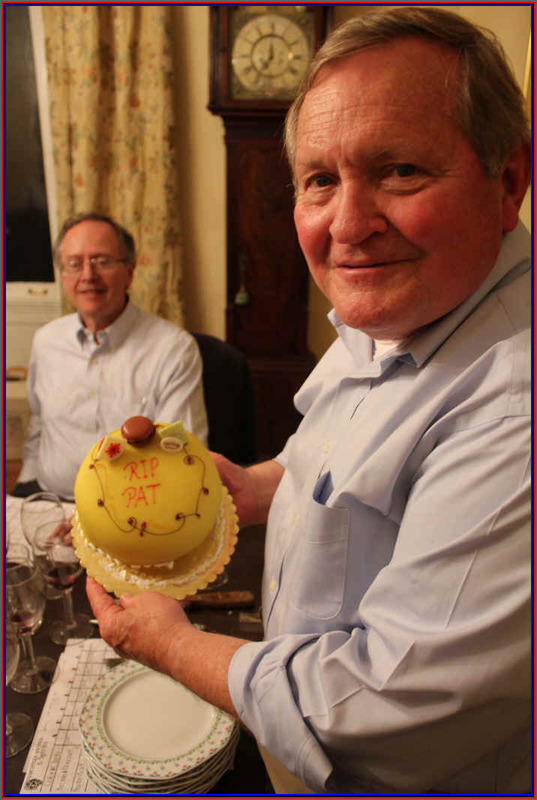 A number of Vino Fino members had attended a memorial service for Pat earlier in the day. Allan went out of his way to bring a bit of sweetness to this otherwise bitter day.